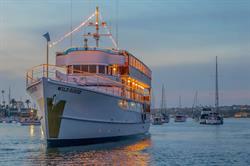 NEWPORT BEACH, CA--(Marketwired - April 17, 2017) - Hornblower Cruises & Events is once again hosting the successful annual series of John Wayne Birthday Dining Cruises aboard his famous yacht, the Wild Goose to commemorate Wayne's May 26 birthday. In addition to the series of birthday cruises, Hornblower will also be hosting an exclusive "Show Your Grit" encounter on John Wayne Day (http://johnwayne.com/journal/john-wayne-day/) in Newport Beach on Friday, May 26 (details below). With three decks of gorgeous woodwork, priceless paintings, intricate carvings and unique amenities, the Wild Goose was once the private playground for the legendary actor and famous Newport Beach resident. It was aboard this 136-foot former WWII Navy minesweeper from that Wayne would cruise the waters off Balboa Island or play bridge with famous friends that included Dean Martin, Bob Hope and Sammy Davis, Jr.
Birthday Cruise Highlights: Passengers will be transported back in time as they enjoy a variety of cruises aboard the Wild Goose, between May 18 and June 18, meet Wayne's Captain, 83-year-old Bert Minshall, who will be on board to share stories as well as autographing the book On Board With Duke and chat with other John Wayne fans. Guests will also have the opportunity to capture a picture with the wax version of John Wayne, the iconic figure on loan from Madame Tussaud's Hollywood. In addition, Hornblower will cruise-by the location that was formerly John Wayne's 10-bedroom, 7-bath waterfront mansion where he and his family lived and Wild Goose was docked for many years. 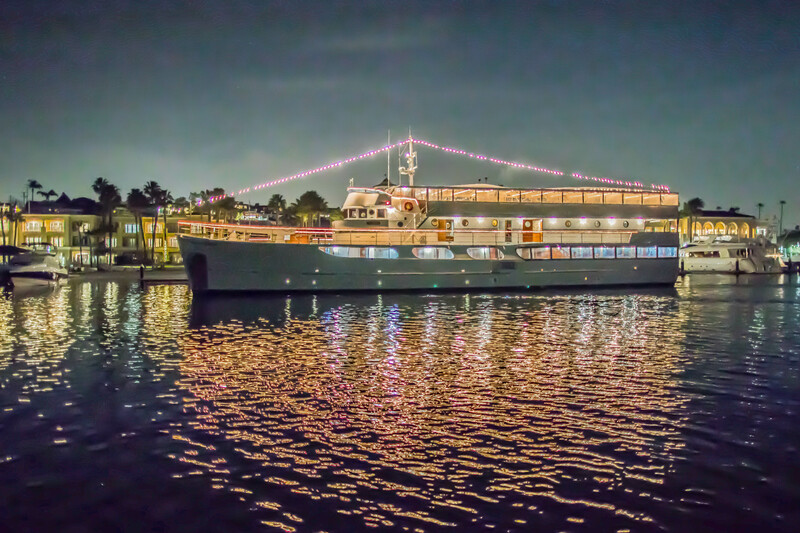 Passengers will enjoy their cocktail cruise, 4-course dinner or brunch in a historic setting and will have an unforgettable front seat to the glorious sights and sounds of Newport Beach harbor, with views of beautiful beaches, towering luxury yachts and sprawling celebrity mansions. Informal tours of the Wild Goose will be available by the Hornblower crew during the cruise. Guests can also enjoy drink specials made with "Duke Bourbon." Additionally, a portion of the ticket sales will benefit the John Wayne Cancer Foundation in support of John Wayne's final wish -- to find a cure for cancer. Learn more about the John Wayne Cancer Foundation at www.johnwayne.org. More About The Wild Goose: For 15 years of John Wayne's life, he spent leisure time on board the Wild Goose, a 136-foot converted World War II US Navy mine-sweeper and sister ship to Jacques Cousteau's Calypso. It was where he traveled the world, relaxed, entertained a list of Hollywood's "who's who" of the time, including Dean Martin, Bob Hope and Sammy Davis, Jr. The Wild Goose was Wayne's most prized possession and is listed on the National U.S. Register of Historic Places. The ship is currently the star of Hornblower Cruises' Newport Beach fleet of charter yachts located at 2431 W. Pacific Coast Highway. Meet Jennifer Wayne, Granddaughter of John Wayne, with a performance from her band Runaway June who recently toured with Tim McGraw. Snap pictures with the famous wax figure of John Wayne on loan from Madam Tussauds of Hollywood. Meet John Wayne former Captain Bert Minshall, who will autograph copies of his book "On Board with the Duke" which are available for sale on board (with a portion of proceeds going to John Wayne Cancer Foundation). Enjoy special cocktails blended with Duke Bourbon (with a portion of proceeds to JWCF). Cruise by the Wayne family home location near Balboa Island. Enjoy gourmet hors d'oeuvres, carved meats and tray-passed delicacies. Opportunity to purchase merchandise and memorabilia from John Wayne Enterprises, Wild Goose and Runaway June. Cost is $195 per person or VIP tickets at $250, which is inclusive of front row seating and swag bag containing Wild Goose Mug and cap. 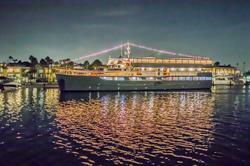 This May 26 cruise will board at 6:30 pm and cruise from 7:00-9:00 pm. A portion of the ticket proceeds will be donated to the John Wayne Cancer Foundation. To purchase tickets: Call 888-Hornblower or visit hornblower.com on the Newport Beach Dining page. Taxes and service fees are additional. Discounts are available for children, groups, seniors and the military. Hornblower Cruises & Events has been the leading charter yacht and public dining cruise company in California for 36 years. The company operates 49 vessels, including the three largest dining yachts on the West Coast, in San Francisco, Berkeley, Sacramento, Long Beach, Newport Beach, Marina del Rey, San Diego, and New York City. Two Hornblower subsidiary businesses, Alcatraz Cruises and Statue Cruises, are National Park Service ferry concessioners to Alcatraz Island and the Statue of Liberty and Ellis Island, respectively. This year, Hornblower began operating the third subsidiary, Hornblower Niagara Cruises, out of Niagara Falls, Ontario, Canada. For more information visit: www.hornblower.com.